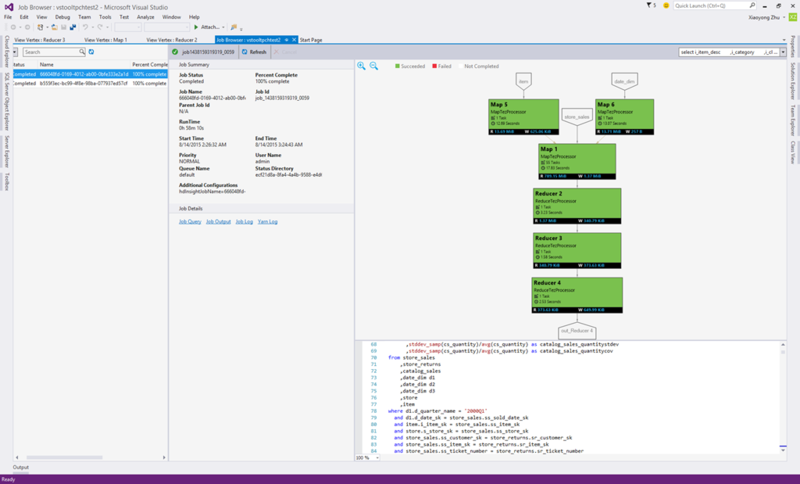 Today, we’re excited to announce Azure SDK 2.7.1 for Visual Studio 2013 and Visual Studio 2015. This release includes some improvements to the Visual Studio Tools for Azure and enhance the customer experience who are enrolled in either the DreamSpark or Cloud Solution Provider programs. This post summarizes the updates and how the new tools will improve your Azure development experience. Improved support for Visual Studio 2013: Azure SDK 2.7.1 brings Visual Studio 2013 on par with the capabilities available in the Azure SDK 2.7 release for Visual Studio 2015. 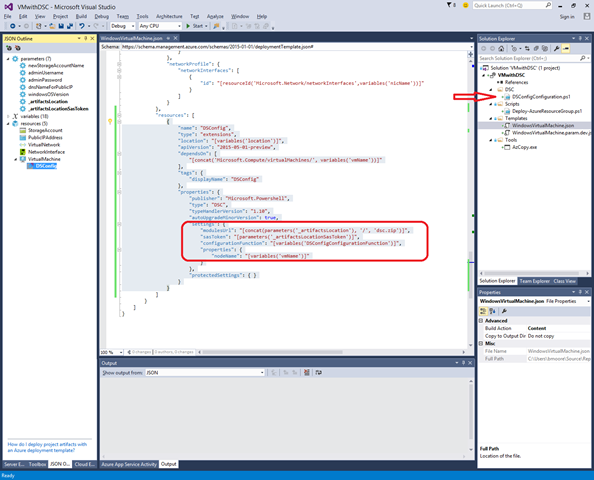 Visual Studio 2013 now supports DreamSpark and Cloud Solution Provider customer accounts. The new Cloud Explorer tool window is now also available in Visual Studio 2013. 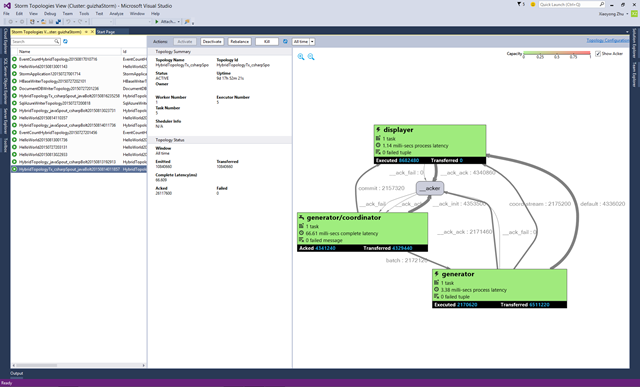 Improvements to the HDInsight tools for Visual Studio: Big data developers will benefit from improvements to the Hive Job Operator view, the Hive Error Marker, and the Storm Topology Graph. We’ve also made some improvements to IntelliSense suggestions for HDInsight. The Azure Resource Manager Tools have been updated to include better IntelliSense and to automate deployment of virtual machines with in-guest customization easier. AZCopy 3.2.0 RTM: This update includes the support for new storage blob type Append Blob and FIPS compliant MD5 setting. You can find more details on the Azure Storage blog. In the Azure SDK 2.7 release we added support in Visual Studio 2015 for accounts accessing Azure via Role Based Access Control, Cloud Solution Providers, DreamSpark and other account and subscription types. With the Azure SDK 2.7.1 these accounts and subscriptions are now supported in Visual Studio 2013 as well. Azure SDK 2.7.1 also brings the Cloud Explorer tool window to Visual Studio 2013. Now all the performance and scalability improvements available through Cloud Explorer in Visual Studio 2015 are also available in Visual Studio 2013. Azure Resource Manager Tools have been improved to include IntelliSense for more resource providers and to make deploying virtual machines with in-guest customization easier. IntelliSense will now show some error checking for template language expressions including function name & parameter or variable checking. Autocomplete has been updated to include more resource providers including Storage, Networking and Compute. 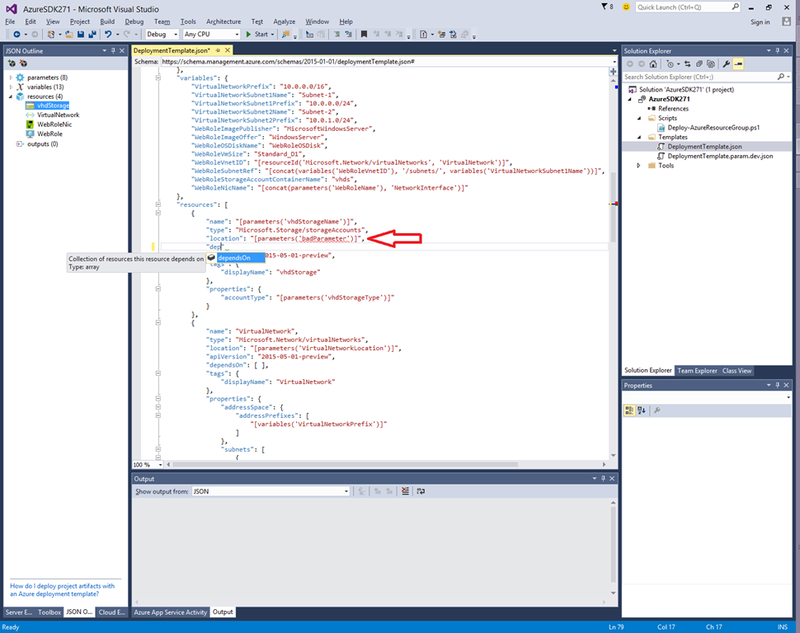 Note, that the schemas that drive IntelliSense are cached but you can manually update them by pressing Ctrl+Shift+J or right-click and select “Reload Schemas” while editing a deployment template. 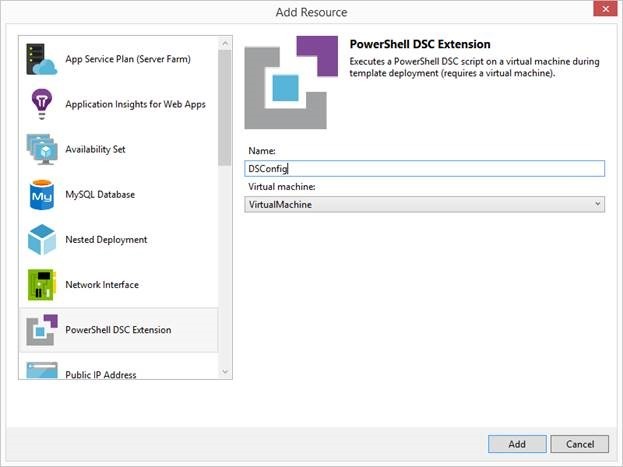 For virtual machine configuration, when using the JSON Outline view to add JSON snippets to your template, the template and project will be updated to automatically stage configuration artifacts for Azure Resource Manager during deployment. In the JSON, you can see that the properties have been parameterized and a script for configuration is added to the project automatically. 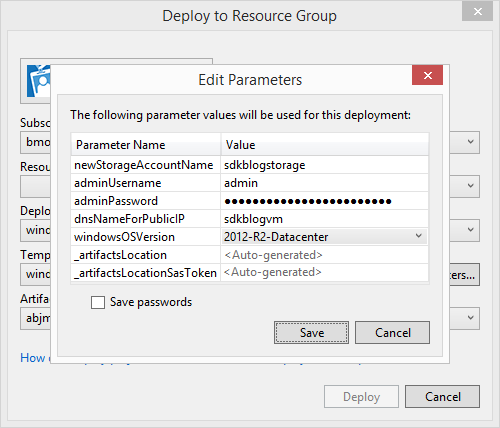 When you deploy your template, the Deploy-AzureResourceGroup.ps1 script used by Visual Studio to deploy the template will automatically create and upload the zip archive used by DSC to configure the virtual machine. The template parameter values are then set automatically by the script to tell Azure Resource Manager where to find the artifacts for deployment -- you do not need to stage your artifacts manually before deployment since it is handled by the tools. If you already have artifacts in a specific location, you can simply provide those values during deployment and those values will be used instead of the values generated. 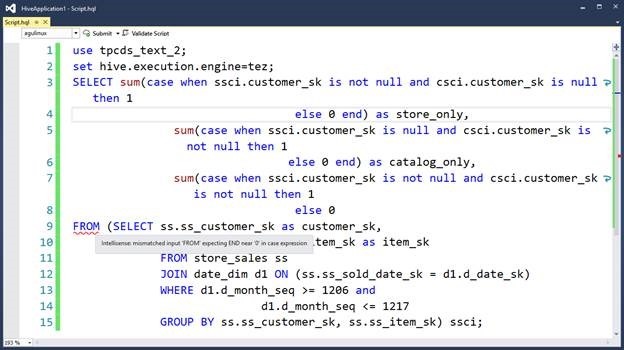 This section will elaborate on some of the updates the HDInsight team have made to their Visual Studio tooling experience. The clusters created in the new Azure portal (https://portal.azure.com) cannot be listed in the existing HDInsight Tools for Visual Studio version. We have made several changes and now everything works perfect there – you can view and submit jobs to all your clusters no matter where they are created. To help you understand your Hive query better, we add the Hive Operator view in this release. You just need to double click on the vertices of the job graph and you can see all the operators inside the vertex. You can also hover on a particular operator to view more details of this operator. In this release we introduced Hive error marker so you can view the grammar errors instantly. Also, we enhanced the error message so you can now see the exact same error message in case there are syntax errors in your Hive script, without submitting & executing the script on the cluster. Visualizing is very important when you want to see if your topology is working as expected or not. In this release we added visualization for Storm graphs. You can see the important metrics for your topology visually and see if a certain Bolt is “busy” or not by the color. You can also double click the Bolt/Spout to view more details. We have improved the IntelliSense by adding more user friendly suggestions there. For example, table alias can now also be suggested in IntelliSense so you can write your query more easily. Also, we have improved the Hive metadata loading so it will just take several seconds to list all the databases, tables and columns of your Hive metastore. Please make sure to check the Azure SDK 2.7 release notes appendix for the 2.7.1 release for information about breaking changes from previous versions and known issues with the new features. If you don’t already have an Azure account, you can sign-up for a free trial and start using all of the above features today. Then visit the Azure Developer Center to learn more about how to build apps. You can also submit bugs through Connect, suggestions through UserVoice, and quick thoughts or ideas through Send-a-smile in the Visual Studio IDE. This blog article is a collaboration of multiple people. Big thanks to Brian Moore, Xiaoyong Zhu and Saurabh Bhatia.